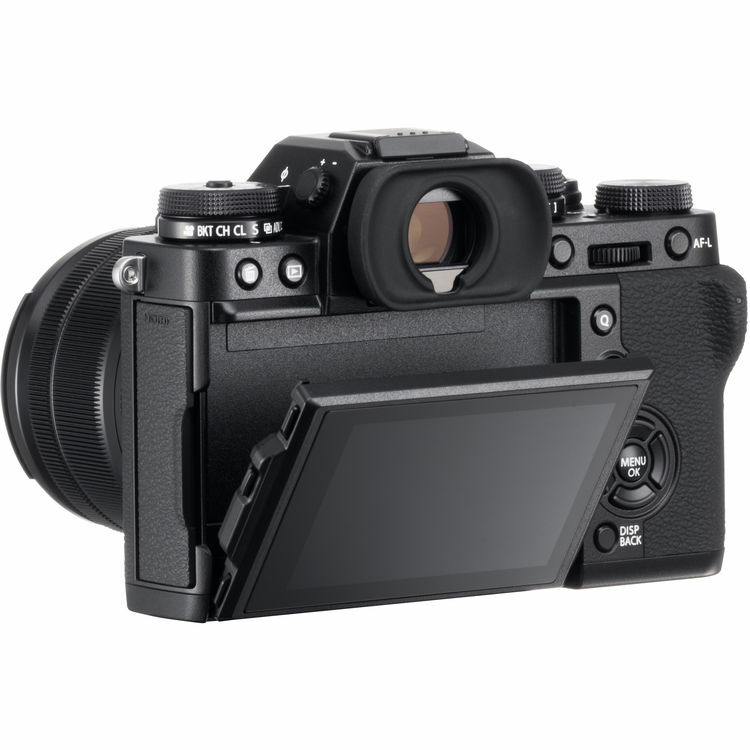 Designed for videographers and action photographers alike, the black Fujifilm X-T3 is a versatile mirrorless camera characterized by its high-speed performance, more-than-capable imaging, and multimedia flexibility. Revolving around a newly developed image sensor and processor, both high-resolution stills and 4K video can be recorded while an apt autofocus system delivers quick and accurate focusing performance. The sensor, a 26.1MP APS-C-format X-Trans CMOS 4, features a back-illuminated design, to promote greater image quality throughout the sensitivity range, along with an expansive 2.16m-point phase-detection autofocus system for quick, precise AF performance and subject tracking. Complementing the imaging and focusing is the X-Processor 4, which uses four CPUs for faster image processing as well as continuous shooting up to 11 fps with a mechanical shutter, 30 fps shooting at a 1.25x crop and electronic shutter, and internal 4K60p 10-bit video recording. 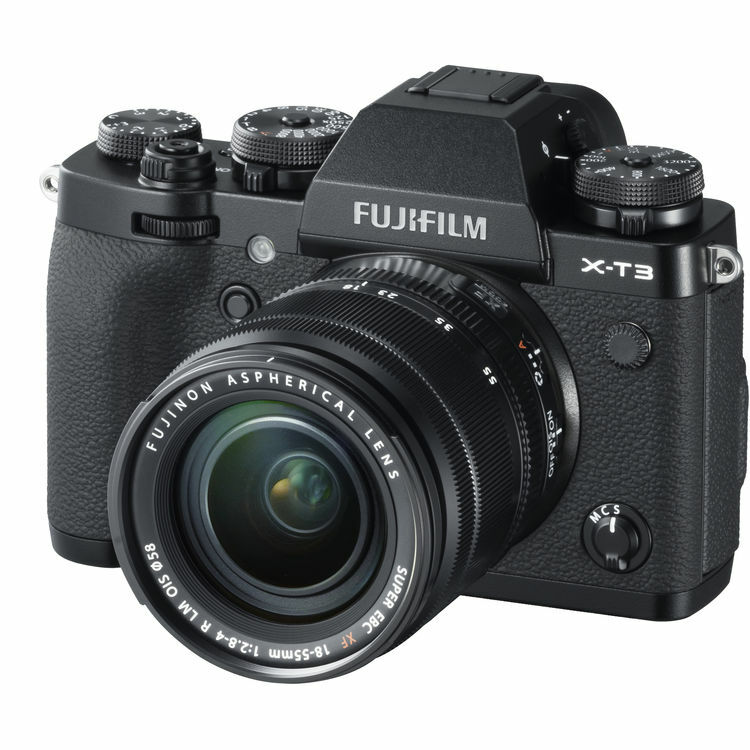 Like previous X-T cameras, the X-T3 retains its classically inspired looks and prominent tactile controls, and adds a new OLED electronic viewfinder design with 3.69m-dot resolution and a high 0.75x magnification. This finder has a high refresh rate of 100 fps for fluid viewing and remains blackout-free while shooting at the top 30 fps shooting rate. Also, a unique Sports Finder Mode can be used, which highlights the 16.6MP crop area in order to give you additional room outside of the frame to recognize moving subjects. Conversely, a rear 3.2" 1.04m-dot LCD monitor can also be used for live view shooting and larger image playback. 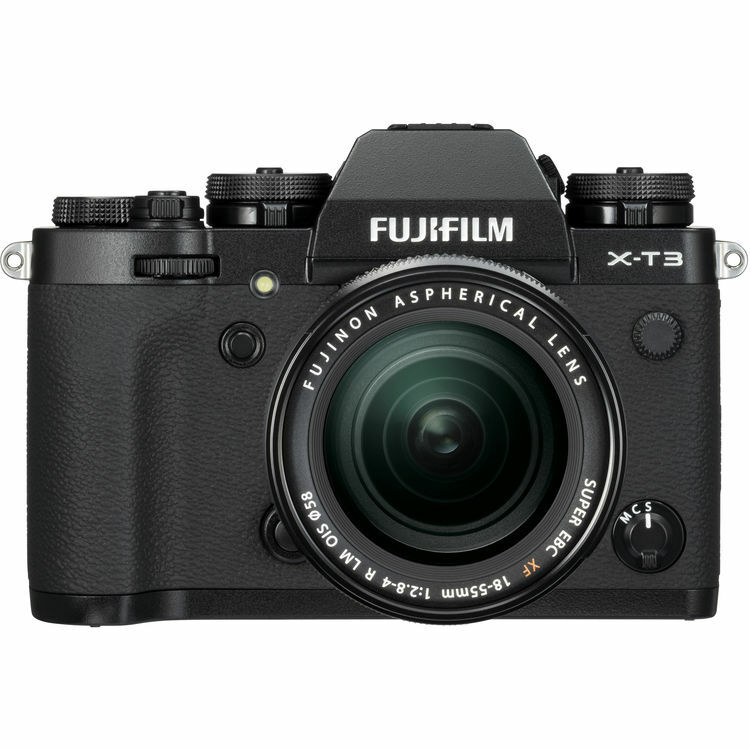 Additionally, the X-T3 also sports built-in Bluetooth for wireless sharing and remote control, and the magnesium-alloy body is fully weather-sealed for working in trying weather conditions. Revolving around a newly developed sensor, the X-T3 features an APS-C-format 26.1MP X-Trans CMOS 4 sensor, which has a back-illuminated design to afford smooth tonal rendering, improved low-light performance, and a low native ISO 160 setting. As an X-Trans sensor, it still utilizes the randomized pixel array, too, which provides a high degree of image quality and sharpness due to the omission of an optical low-pass filter. Versus conventional pixel patterns, the X-Trans design more closely mimics the organic nature of film in order to produce nuanced colors and tonal transitions, while also reducing moiré and aliasing. The sensor's design also includes an expanded phase-detection autofocus system, which now has an impressive 2,160,000 points that cover nearly the entire sensor area. This AF system delivers faster, more accurate focusing performance along with low-light sensitivity down to EV -3. Complementing the imaging and focusing capabilities, an updated X-Processor 4 is also featured, and delivers faster focus response for subject tracking and also supports Face- and Eye-Detection AF when working in AF-C mode and when recording video. The X-Processor 4 also utilizes four CPU units for faster image processing and it benefits overall performance with AF speeds as low as 0.06 sec. 0.17 sec shooting intervals, 0.045 sec shutter lag, and a 0.3 sec start-up time. Quick continuous shooting is possible, up to 11 fps with a mechanical shutter or 30 fps with an electronic shutter and a 1.25x crop, and internal UHD 4K60 video recording with 10-bit output is also supported. More than a stills camera, the X-T3 offers an enticing array of video capabilities, including internal UHD 4K60p video recording at 4:2:0 10-bit, as well as 4K60p 4:2:2 10-bit via HDMI output, both at up to 400 Mb/s—and simultaneous external and internal recording is possible. DCI 4K30 and Full HD 1080p120 recording is also possible, and video files can be saved using either MPEG-4 AVC/H.264 or HEVC/H.265 compressions, and 4K. Greatly benefitting overall video performance, the speed of the quad-CPU X-Processor 4 enables fast read speeds of 17 ms when recording 4K60 video, which helps to reduce rolling shutter distortion when filming moving subjects. In addition to the supported 10-bit color depth, the X-T3 also includes the F-Log gamma setting, which provides a flat picture for use in advanced color grading software during editing. This maximizes the potential dynamic range in difficult scenes and image adjustments can be made, as well, to highlight tone, shadow tone, color, and sharpness. When working in F-Log, an updated noise reduction algorithm is available along with 4K inter-frame noise reduction, and the minimum sensitivity has been lowered to ISO 640 to suit working in a broader range of scene types. Also, the camera features a 3.5mm microphone jack and 3.5mm headphone jack for more advanced audio solutions. A bright and clear means for eye-level viewing, a 3.69m-dot OLED electronic viewfinder offers a high 0.75x magnification, fast ~100 fps refresh rate, wide viewing angle, and lockable diopter adjustment. The viewfinder remains blackout free while shooting up to the top 30 fps shooting rate, and a unique Sports Finder Mode can also be employed, which highlights a 16.6MP crop area of the sensor in order to allow you to see outside of the image frame. In addition to the EVF. a rear 3.0" 1.04m-dot LCD touchscreen is available for intuitive live view shooting, playback and review, and settings adjustment and menu navigation. The screen has a three-way tilting design, too, to suit working from high and low angles regardless if shooting with a horizontal or vertical orientation. Dual SD card slots allow for a more flexible and reliable means of storing imagery, and both card slots are compatible with UHS-II standards for fast transfer speeds. The top plate incorporates a series of locking dials and levers for fast, intuitive control over exposure settings, including a shutter speed dial that offers direct shutter speed adjustment. An ISO dial is also incorporated into the shutter speed dial, for confirming the sensitivity setting without having to turn the camera on and the exposure compensation dial lets you choose +/- 3 EV in 1/3 steps while a command dial position expands the range to +/- 5 EV for further control. Front and rear command dials integrate a push function for easier use and settings selection and six different function buttons can be assigned to control a range of settings. 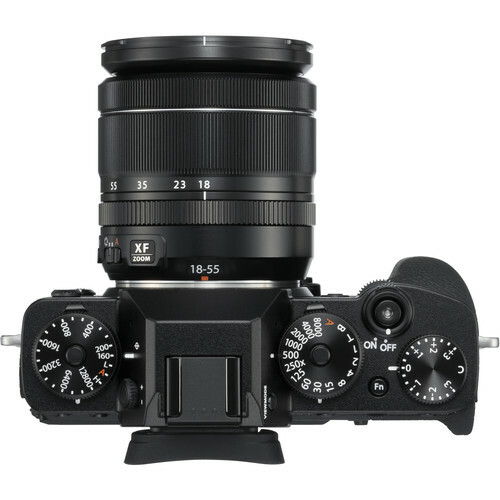 Taking advantage of Fujifilm's vast history in traditional film-based photography, the X-T3 integrates several Film Simulation modes. These modes mimic the look and feel of some of Fujifilm's classic film types, including Eterna, which copies the look of cinematic film with understated colors and richer shadow tones; Acros, which offers smooth tones, deep blacks, and fine detail; and Classic Chrome, which is designed to deliver muted tones and a deep color reproduction, similar to that of a dated slide film. Several other effects are also available for both monochrome and color shooting. In addition to simulating specific film types, a Grain Effect mode is also available to replicate the look of old film photos with an organic textured appearance, which is especially noticeable when printing. Box Dimensions (LxWxH) 9.5 x 8.0 x 7.0"